Saturday Evening, July 10th at 7:30PM at Teni Cultural Institute, 43A West 13th St., ARTS AT TENRI will continue its 2010 season with a program of Violin and Piano Sonatas by Beethoven. The program will include the First Sonata, opus 12 number 1, the Fifth Sonata, “Spring Sonata” and the Ninth Sonata, “Kreutzer Sonata.” Free tickets and reservations for this special event, which honors Carl Demler and Beethoven Pianos are available through Arts at Tenri at 212-645-2800. Hisaya Sato and Albert Lotto, violinist and pianist, will be joined by Carl Demler and his team from Beethoven Pianos in order to dedicate the use of a new Grotrian Concert Grand Piano for Arts at Tenri and Tenri Cultural Institute. The piano is on indefinite loan through the kindness of Mr. Demler to Arts at Tenri and Tenri Cultural Institute. The excellent acoustics and intimate gallery setting of the Tenri Cultural Institute create a superb setting for listening to chamber music, and ARTS AT TENRI offers audiences the rare opportunity to hear both traditional and contemporary music from two cultures in a setting similar to the music rooms of the courts and castles of both Europe and Japan. Over 300 years of chamber music tradition will be presented throughout this series. Piano trios and string quartets from the great composers of Europe will alternate with music from Japan's Edo period written for the standard trio of shamisen, koto and shakuhachi. Contemporary music for both western and Japanese instruments will be heard as well. The performances of Hisaya Sato, violinist, have been praised in newspapers throughout Europe. Critics refer to him as a "virtuoso of the soul", "a master performer" and refer to his performances as an "outpouring of passion", "maintaining an unparalleled and uniquely rich tone". His performances include solo and chamber music appearances through out Germany, France, England, Austria, Switzerland, The Netherlands, Belgium, Poland, The Czech Republic, Sweden, Italy, Australia, New Zealand and Japan. Appearances as soloist with orchestras include engagements with The Berlin Symphony Orchestra, Belgrade Philharmonic, Romania State Philharmonic, Berlin Chamber Orchestra, Symphony Orchestra of Santiago, as well as engagements with orchestras throughout Japan. Broadcasting engagements as a soloist include concerts with German Radio, Radio France, Radio Italien and NHK Japan. Chamber Music engagements include tours throughout Germany, Asia, The Middle East, and Oceania. In demand as an orchestral leader, Hisaya is frequently invited as the guest-concertmaster with major orchestra in Japan and abroad. Since 2002, Hisaya has offered a series of violin recitals in Tokyo at various venues. An accomplished recitalist, he has given first performances of romantic violin pieces by European composers including Wilhelmj, Ondricek, Vecsey, Zsolt, Prihoda, Vladigerov, Furtwangler, Thuille, Koessler, Vruels, Bowen, Hubay and others at his series of Tokyo recitals. Recent CD recordings include the Violin Sonatas of Felix Weingartner and the Violin Concerto of Akira Ifukube. He is also the prizewinner of numerous international competitions including the "Ruggiero Ricci Masters Competition", "Masterplayers", "Lugano", "Luis Sigall", "Belgrade" and "Viotti" competitions. - Hide quoted text - Kunste Berlin in Germany. 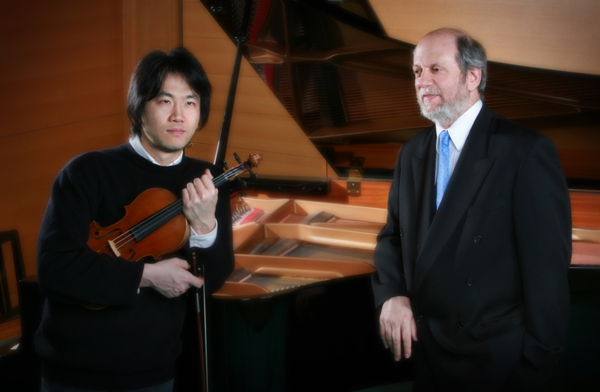 Hisaya's teachers include Yoko Seto, Takashi Shimizu, Bela Katona, Takaya Urakawa, Valery Klimov, Igor Oistrakh, Salvatore Accardo, Ruggiero Ricci, Ivry Gitlis and Yehudi Menuhin. He performs using a violin of Josef Guadagnini, made in 1783.